The Toronto Maple Leafs shook up their roster with a pair of big moves on Sunday, the biggest coming in a trade for star defenseman Dion Phaneuf from the slumping Calgary Flames. 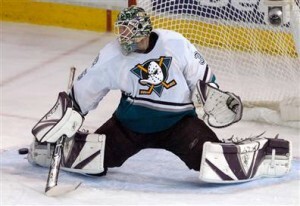 The Leafs also acquired veteran goalie Jean-Sebastien Giguere from the Anaheim Ducks for Jason Blake and Vesa Toskala. The Leafs acquired Phaneuf, right wing Fredrik Sjostrom and defenseman Keith Aulie in exchange for defenseman Ian White, center Matt Stajan, left wing Niklas Hagman and right wing Jamal Mayers. Phaneuf had 10 goals, 12 assists and 49 penalty minutes as of Sunday. 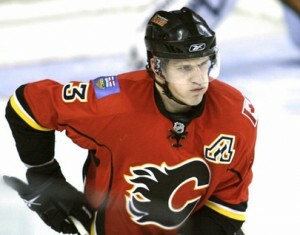 In 378 career games over five seasons he has 75 goals, 153 assists and 522 penalty minutes, all with the Flames. The Leafs gave up two of their top scorers in Stajan (16 goals, 25 assists) and Hagman (20 goals, 13 assists) to obtain Phaneuf. On the surface Toronto looks to have made out well. Phaneuf is a very good defenseman. Giguere replaces Toskala who has been a bust for Maple Leafs since coming over from San Jose. Toronto is 17-28-11 this season, or the worst record in the Eastern Conference. There is no chance in hell this trade will get the Maple Leafs to the playoffs this year. Giguere hasn’t been playing well this year, 3.1 GAA and .900 save percentage, and his trade comes as no surprise*. That’s an improvement on Toskala who has 3.66 and .874 respectively. Still the numbers are worse for Giggy than they are for Washington Capital Goalie Jose Theodore and regular OTB Sports readers know what I think of that Goalie. Toronto must be hoping for a Giguere bounce back in 2010-11. Oh you get two defensemen but trade away players(Hagman** and Stajan) who have contributed 36 goals for your team this year. I don’t see these trades helping Toronto short term and long term doesn’t look all that great either IMHO. *- Anaheim signed their other Goalie, Jonas Hiller, to a 4-year contract yesterday. That made the high priced Giggy expendable. It looks almost certain Hiller will be in goal when I watch Florida and Anaheim play tomorrow night. Particularly since the Ducks haven’t played since Friday night. **- I guess that ends the Hagman to Florida Panther trade rumors. Hagman’s first NHL team was the Cats.